A survey in 2014 estimated that over 43% of the United Kingdom population have or have access to a bike and 8% of the population aged 5 and above cycled 3 or more times a week. With such a large amount of people cycling, whether it be professional, recreational or for commuting this increase the chance of developing an injury, so it is time we understood the biomechanics of cycling. There are 2 main phases of the pedal cycle; the power phase and the recovery phase. If you imagine the pedal cycle as a clock face and you start with the pedal at 12 o'clock, this is known as Top Dead Centre (TDC). The pedal is then pushed down from 12 until 6 o'clock, this position is known as Bottom Dead Centre (BDC). The phase between the 2 is known as the Power Phase where all the force is generally generated to propel the bike forward. Have a look at this video to see a clear explanation of TDC and BDC. The transition from BDC back up to TDC is known as the Recovery Phase. Now not all of the muscles just switch of during this phase, it just is not as active as the Power Phase. 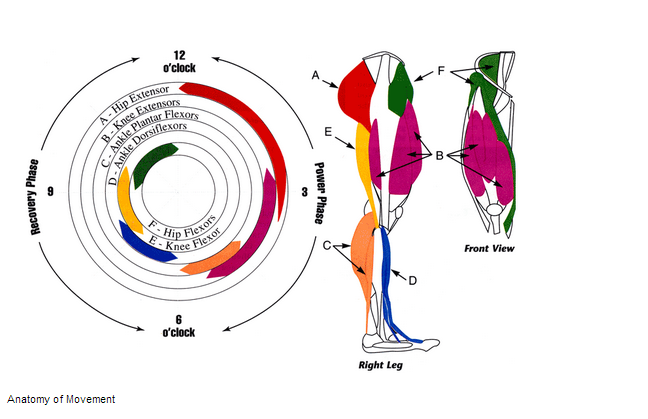 If you look at the image you can see what muscles are working at which points during the pedal cycle. There are many components that are working whilst cycling this is not just a sport of the lower limbs. Below, the areas of anatomy have been broken down to provide more detail on what is happening and when. Have a look a the video below and then have a read of the text below. The pelvis is the start of the lower limb complex, and is compromised of the ischium and the ilium. The ischial tuberosities (also referred to at the sitting bones) are located here and play an important role for the hamstrings, as this is where all three originate. The hip is also an important anatomical feature as this is a large 'ball and socket' type joint, which allows for a large degree of multi-directional movement. During cycling the hip allows for and guides hip flexion, extension and small degree of rotation. Further down the lower limb complex the knee is found. This 'hinge' joint acts as a lever to the femur, as the femur is the longest bone in the body this can create large amounts of torque. This is where the patella plays a vital role, as it acts as a fulcrum and enables the force from the upper leg to be transferred to the lower leg. The patella is a sesamoid bone that sits within the patella tendon and connects the quadriceps to the tibial tuberosity. The patella glides in the intercondylar fossa of the femur. Moving down the lower limb complex the next main joint of relevance is the ankle. This joint allows for dorsiflexion and plantarflexion in cycling, which allows for a term known as 'ankleing' where the foot moves from a dorsiflexed position to a plantarflexed position through the bottom of the pedal stroke before returning back to a dorsiflexed position. The initiation of the pedal cycle starts with the gluteals, taking the hip from a flexed position at TDC through the power phase to an extended position. Then at approximately 3 o'clock in the pedal cycle the quadriceps kick in to take the knee from it's flexed position to an extended position at BDC. The main role of the hamstrings is knee flexion but they also assist hip extension. During cycling (depending on the position that is adopted by the cyclist, if on an upright bike), the ischial tuberosities may take most of the load through the saddle, therefore compressing the origin of the hamstrings. The hamstrings main role in cycling is to assist knee flexion up through the back part of the pedal stroke but they also play an important part in stabilising the knee through BDC. Further down the chain into the lower leg the gastrocnemius and soleus haven't been found to add much power to the pedal stroke but their main role is to stabilise the lower leg to enable an efficient transition of the force generated by the upper leg to the pedal. There is more to cycling than the movement of the lower limbs. The trunk and back play an important role in stabilising the spine and maintaining posture. There are many muscles within the back but to name a few: Multifidi and the quadratus lumborum are a couple of the main stabilisers of the spine when undergoing lateral and rotational movements, such as right leg enters the power phase whilst the left side of the spine stabilises and vice versa. The erector spinae muscles also play an important part in maintaining a stable posture whilst on the bike. Abdominal muscles such as the rectus abdominus help to maintain stability as does the obliques. The obliques similarly to the back muscles will help stabilise a contralateral limb movement. As we move up the spine toward the shoulders, the latissimus dorsi and trapezius muscles enable the rider to fix their upper body onto the handlebars. The upper body has a role in stabilising contralateral torque, so as the right leg pushes down the left arm anchors to the handle bars and pulls up. ↑ Cycling UK Statistics. (accessed 24 May 2015) http://www.cyclinguk.org/resources/cycling-uk-cycling-statistics#How many people cycle and how often? ↑ CA Wilber, C1 Holland, RE Madison, 5F Loy. An Epidemiological Analysis of Overuse Injuries Among Recreational Cyclists. Int. J. Sports Med. 1995;16(3): 201 -206.